The NAR is pleased to announce that NARAM-60 will include the Fly-It/Take-It (FITI) program. 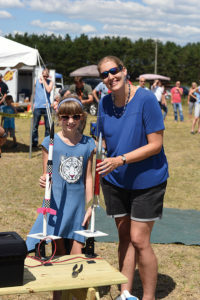 This is how the NAR membership “pays it forward” and introduces the joy of model rocketry to the next generation of rocket fliers. The Fly-It/Take-it event is an activity aimed at people of any age who would like to fly a model rocket for the first time. The NAR gives them the opportunity to fly a rocket for free, and then keep the rocket! It’s the NAR’s hope that if you fly a rocket, you will find it a fun and exciting activity, and that you will want to fly more rockets! If you have never flown a model rocket before, or have flown a rocket but are 13 years old or younger, you can fly a rocket for free! Come to the main tent at the NARAM-60 sport range and you will find a selection of model rockets to choose from at the FITI table. After you select one that appeals to you, you will be provided help with installing a rocket motor, chute wadding and recovery system. You will then go to the sport range and get to fly your rocket! After your flight, you get to keep your rocket! If you want to make additional flights, you can purchase more motors and wadding from one of the vendors at the Sport Range. How Long Does FITI Last? The Fly-It/Take-It table will be operating Saturday and Sunday, August 4-5 though we are hoping we can keep it running all week. Check back to this page for updates. Where do FITI rockets come from? Fly-It/Take-It rockets are donations from NAR members and sections. Members and sections may want to ask their local hobby shops for donations of kits to FITI. What makes a good FITI rocket? Donated rockets can be any rocket as long as it is new and ready to fly (includes a recovery system.) FITI rockets must be capable of flying on a single, 18mm black powder rocket motor. Complex rocket designs (such as helicopters) are not recommended. Members are encouraged to personalize or customize the rockets they donate to FITI. How do you donate FITI rockets? Want to donate rockets, contact Carol Marple. Donated rocket must be completely built! Rockets can be sent to the NARAM-60 Hotel marked with “HOLD FOR NARAM FITI– Carol Marple”. You can also ship or bring rockets NARAM and deliver them personally to the FITI table at the sport range. Please do not ship rockets to the hotel more than 2 weeks before NARAM.